She’s a freelance illustrator, a college student, former teacher’s assistant, and a self-described diplomat. 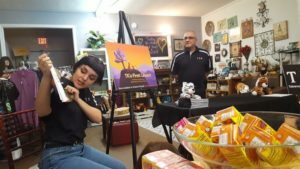 Despite the many abilities of Valley local Stevie Cortez, recognition this time came for the debut of her first illustrated children’s book titled “TK’s First Lesson,” written by David Leija under the TKO brand and organization. Cortez admits that it was her mother’s networking abilities that landed her the illustrating gig. Stevie’s mom, Magda Peynado, is a San Benito regular who plays live music with her husband. She said she knew her daughter had a natural talent for art.